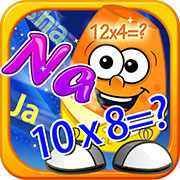 A less expensive option for supplemental help in mastering the times tables is an iOS app that teaches the 0-12 multiplication tables with cartoons, mnemonics and simple rules. It was made by a homeschool family. What is also nice is that it uses a memory method that works for other things besides just times tables. It is less expensive than DVD or book sets. Another nice features is that it does focused drilling for your child, instead of quizzing ones they know over and over it spends more times on the ones they are having trouble with. Previous Post Using Handwriting Without Tears Next Post K12 – Don’t Do It!